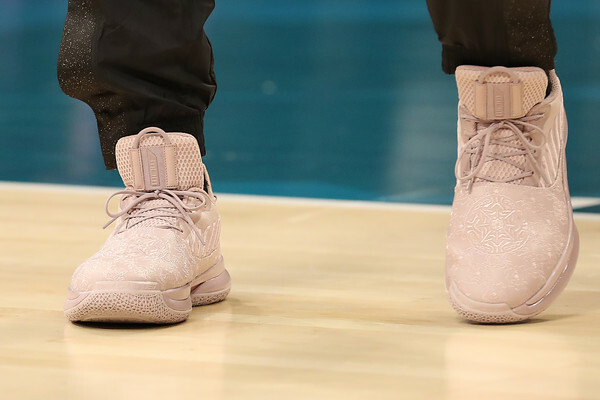 A detailed view of shoes worn by Dwyane Wade #3 of the Miami Heat and Team LeBron are seen as they warm up before playing against Team Giannis during the NBA All-Star game as part of the 2019 NBA All-Star Weekend at Spectrum Center on February 17, 2019 in Charlotte, North Carolina. Team LeBron won 178-164. NOTE TO USER: User expressly acknowledges and agrees that, by downloading and/or using this photograph, user is consenting to the terms and conditions of the Getty Images License Agreement.